This is the ad-free version of this publication. Log In to track Angus Logan on eReaderIQ. to be notified each time the price drops on any book by Angus Logan. to stop tracking Angus Logan. Log In to track Jason Kelly on eReaderIQ. to be notified each time the price drops on any book by Jason Kelly. to stop tracking Jason Kelly. Log In to track John O'Brien on eReaderIQ. to be notified each time the price drops on any book by John O'Brien. to stop tracking John O'Brien. Log In to track Michele Leroux Bustamante on eReaderIQ. to be notified each time the price drops on any book by Michele Leroux Bustamante. to stop tracking Michele Leroux Bustamante. Log In to track Neil Roodyn on eReaderIQ. to be notified each time the price drops on any book by Neil Roodyn. to stop tracking Neil Roodyn. Log In to track Paul (Multiplied Media) Birkbeck on eReaderIQ. to be notified each time the price drops on any book by Paul (Multiplied Media) Birkbeck. to stop tracking Paul (Multiplied Media) Birkbeck. Log In to track Scøtt Lovegrove on eReaderIQ. to be notified each time the price drops on any book by Scøtt Lovegrove. to stop tracking Scøtt Lovegrove. Log In to track Vaishali De on eReaderIQ. to be notified each time the price drops on any book by Vaishali De. to stop tracking Vaishali De. Log In to track CODE Magazine on eReaderIQ. 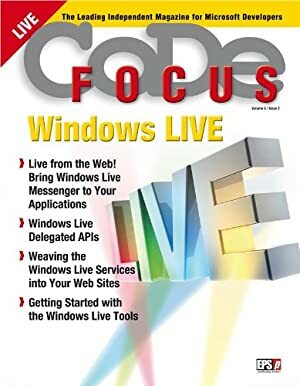 to be notified each time the price drops on any book by CODE Magazine. to stop tracking CODE Magazine. We started tracking this book on January 29, 2013. The current price of this book is $3.99 last checked 4 hours ago. We last verified the price of this book about 4 hours ago. At that time, the price was $3.99. This price is subject to change. The price displayed on the Amazon.com website at the time of purchase is the price you will pay for this book. Please confirm the price before making any purchases.